Way back when we renovated our beach condo, I saved the 6′ wide pair of bifold doors that were in the bedroom knowing that I would use them one day. They were old and grody, but I brought them home anyway and cleaned them up and set them aside. Then I waited and waited and waited some more. I held onto these doors for five years, but inspiration finally struck when I started decorating the media room in our basement. I had Pookie turn the doors into shutters by cutting them in half. 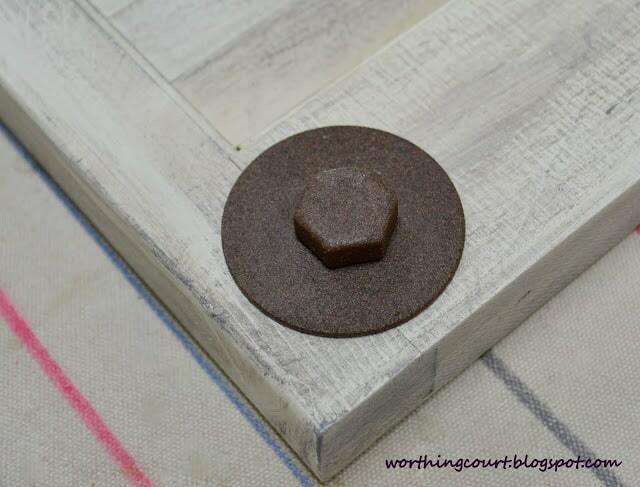 Dry brushing them with gray paint and a little bit of stain gave them depth and added interest. 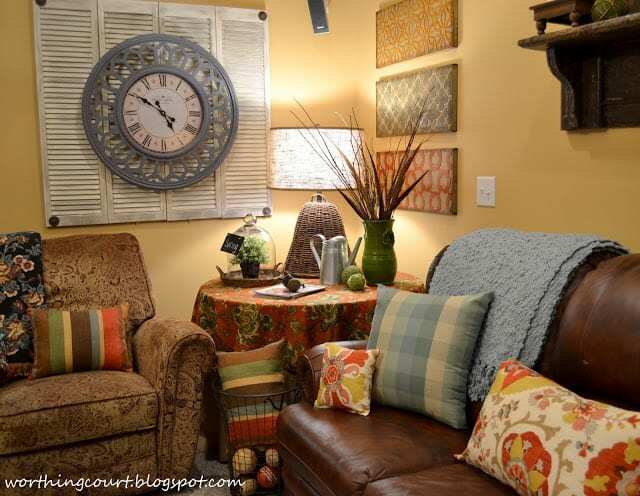 I thought that a subtle way to add to the rustic/industrial vibe that I’m going for in the media room would be to mount the shutters with old crusty, rusty bolts. Two problems with that plan though -I didn’t have any old crusty, rusty bolts and even if I did, they wouldn’t work for mounting these things into sheetrock. 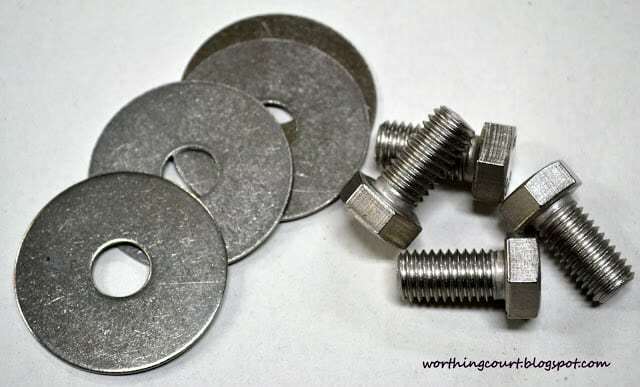 I purchased new chunky bolts and washers, making sure the bolts were no longer than the thickness of the shutters (I didn’t want them to actually go into the sheetrock). 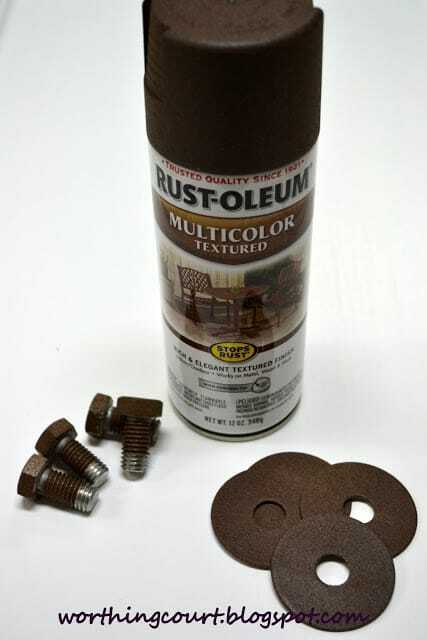 To make them look rusty, I sprayed them with Rustoleum’s textured paint in brown. I was amazed at how authentically rusty they turned out to be. The four bifold door halves were attached together with metal straps and wood joiner thingys on the backside. A ‘D’ ring was added to each side to suspend the doors from. 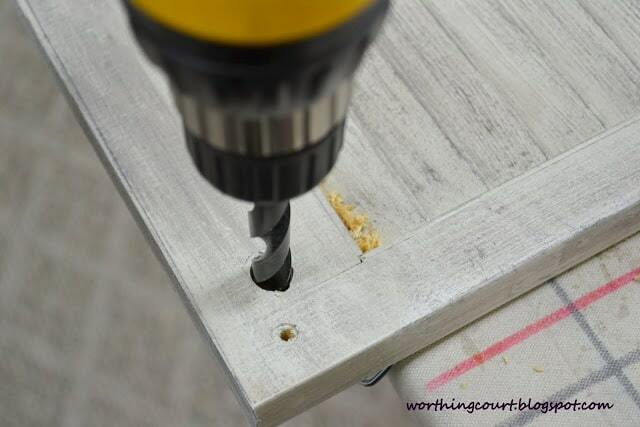 I then drilled a hole in each corner to accommodate the thick bolts. These bolts are just for looks and don’t serve any real purpose, so I simply glued them in place. And that’s all there was too it. Now it looks like ginormous, rusty bolts are holding my shutters on the wall. Here’s a before and after just for fun. Thank goodness I held onto these things! 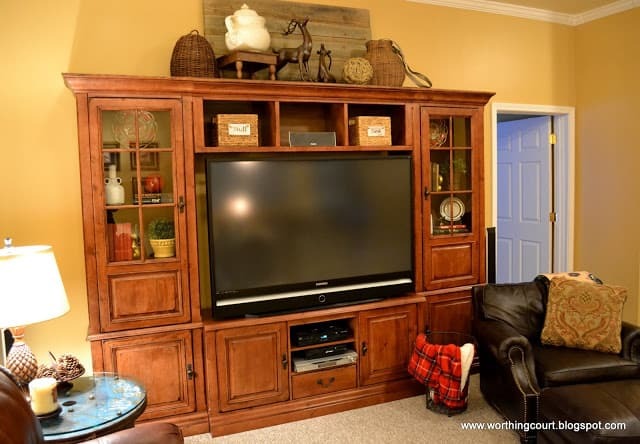 I’ve had lots of fun turning our media room into a rustic with industrial vibe room. Check out some of these projects. These are just a few. Click HERE to see more! 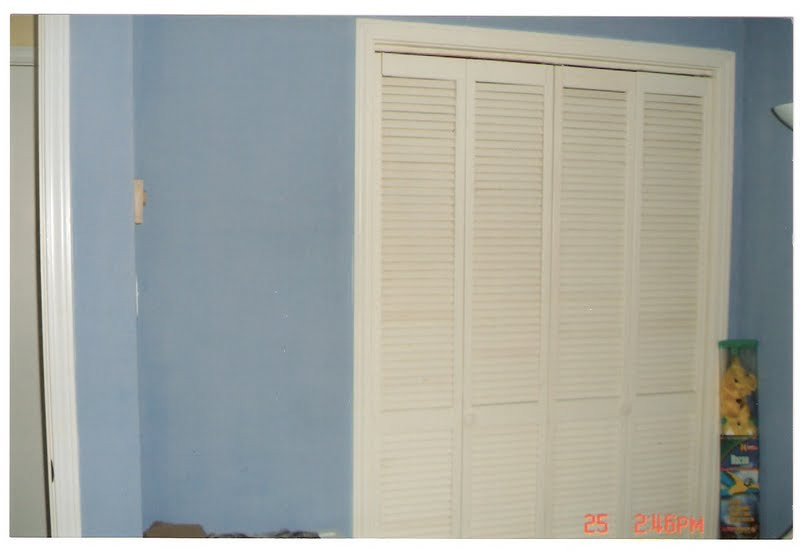 The door turned shutters looks amazing hanging there. A nice backdrop for your clock. I love all the textures. Oh my goodness Suzy I love this, what a great idea!!! When I was in FL visiting my Mom she showed me two bifold doors she had sitting in her garage. She asked me if I had any ideas about what she could do with them? I couldn’t think of anything, but told her not to get rid of them and I would search the web for some ideas when I returned home. So…when I opened my e-mail this morning and saw your post I thought this is perfect!!! 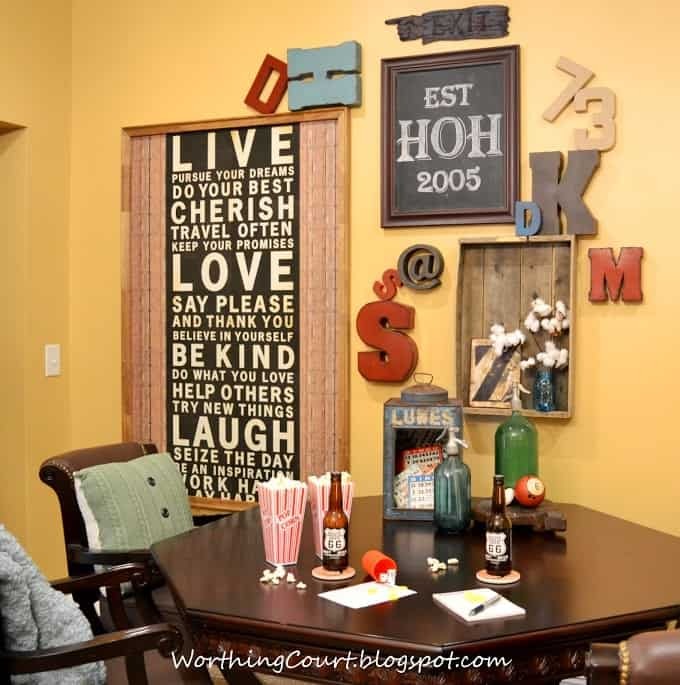 I can’t wait to call my mom and tell all about your wonderful blog and the very creative way you made over your doors! Thank you so much for sharing : ) Have a great day! I love the way that looks and the bolts do look rusty. 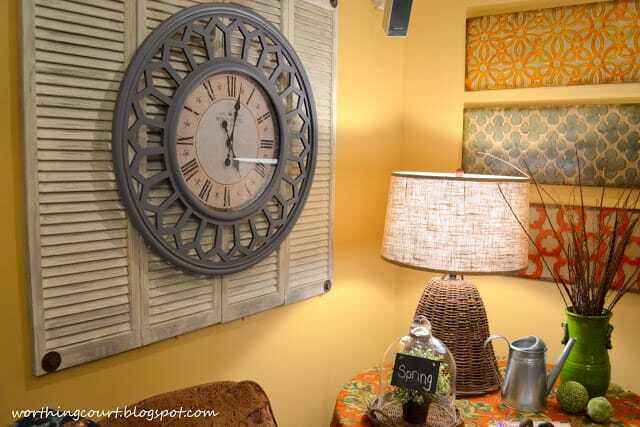 Love it Suzy!…great idea for using them as a backdrop for the clock! !…Looks beautiful!!! This was and is a great idea and I love how this turned out. They make such great spray paints today. 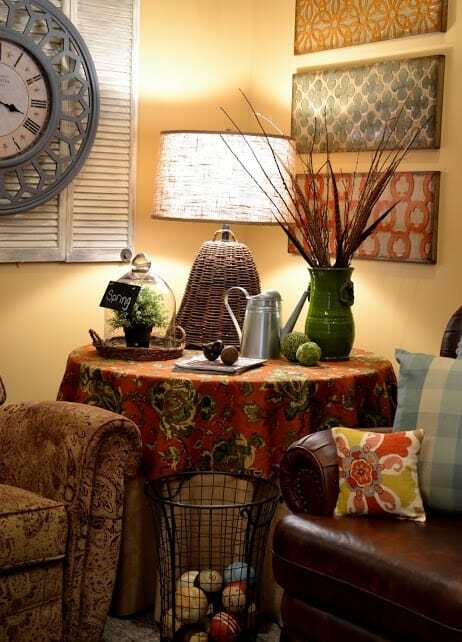 I love the clock and that lamp did turn out great. What a great repurpose! Very creative! Oh I really like it and the use of the bolts really was genius! They look great. Thanks so much for sharing. 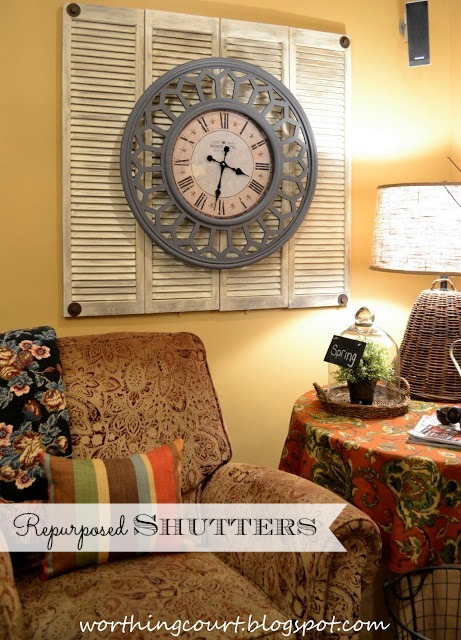 I’ve always loved people using old shutters in various ways. This was a great idea! Love the bolts in the corners!! What a great idea, Suzy! You are so creative! 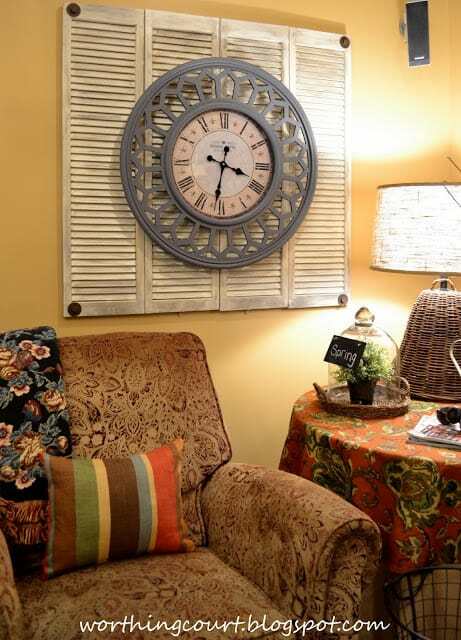 Very smart of you to hang onto those shutters — they look perfect in that spot with the big clock! 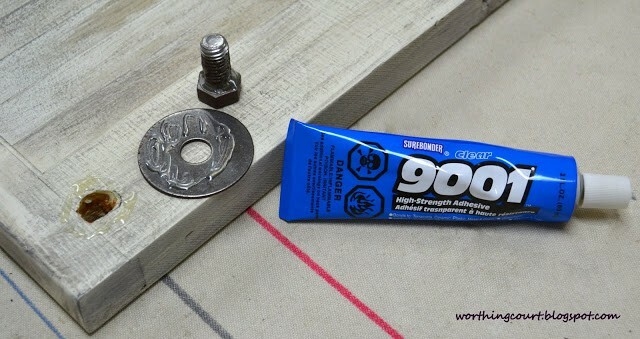 Great way to make new hardware look old — just the right spray paint, who knew? Suzy, I am so glad you held on to those doors. 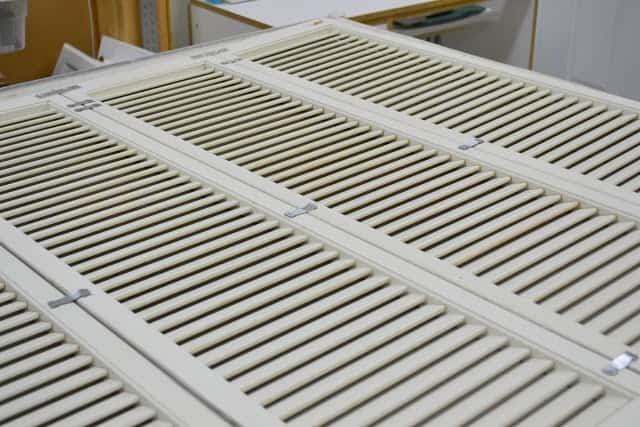 Your shutters look awesome. The industrial hardware was the perfect touch. So stinkin’ cute!! I LOVE it!!! You are brilliant!! 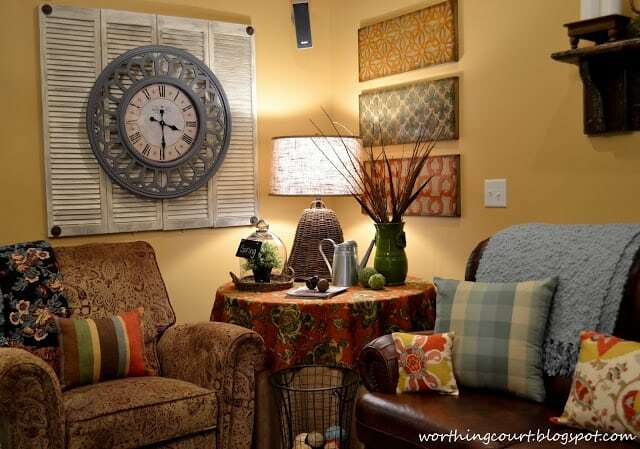 There you go … amazing me with your serious “skeelz!” I love it, Suzy … such a cool way to repurpose, as well as enhance your great clock! Such a great space! Great job! I still need to re-read the chalk tutorial. I think I just need to print it out and play with it! I am very inspired! The bifold doors-shutter is looking awesome.